MINNEAPOLIS & REHOVOT, Israel — (BUSINESS WIRE) — November 20, 2014 — Stratasys Ltd. (Nasdaq: SSYS), a global leader of 3D printing and additive manufacturing solutions announced that the Stratasys Mojo 3D Printer with Print Pack Starter Package is available for purchase on Amazon.com. This new addition to Amazon.com gives business owners, entrepreneurs, engineers and educators the opportunity to purchase a professional-grade 3D printer that is suitable for office spaces, directly from Amazon.com. The Stratasys Mojo 3D Printer prints professional-quality models using Stratasys’ Fused Deposition Modeling (FDM) Technology. The Mojo can produce concept models and functional prototypes, in ABSplus thermoplastic material. The Mojo offers fine-feature detail that is only available on larger production systems like the Fortus Production 3D Printers. Suitable for office spaces, Mojo measures 25 in. wide, 21 in. deep and 18 in. tall (64 x 53 x 46 cm). The ease of water-soluble support removal allows for hands-free cleaning of the most intricate moving parts. 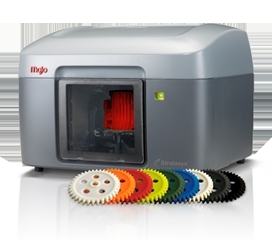 The Mojo Desktop 3D Printer is part of the Stratasys Idea Series. The Mojo 3D Print Pack Starter Package includes a desktop 3D printer, a startup supply of materials and bases, the Mojo Print Wizard and Control Panel software and the WaveWash 55 support removal system. To purchase a Mojo 3D Printer, visit the Mojo page on Amazon.com. For more information on the Mojo 3D Printer, visit the Mojo page on Stratasys.com. Stratasys Ltd. (Nasdaq: SSYS), headquartered in Minneapolis, Minnesota and Rehovot, Israel, is a leading global provider of 3D printing and additive manufacturing solutions. The company's patented FDM®, PolyJet™, and WDM™ 3D Printing technologies produce prototypes and manufactured goods directly from 3D CAD files or other 3D content. Systems include 3D printers for idea development, prototyping and direct digital manufacturing. Stratasys subsidiaries include MakerBot and Solidscape, and the company operates a digital-manufacturing service, comprising RedEye, Harvest Technologies and Solid Concepts. Stratasys has more than 2,500 employees, holds over 600 granted or pending additive manufacturing patents globally, and has received more than 25 awards for its technology and leadership. Online at: www.stratasys.com or http://blog.stratasys.com. FDM, Stratasys and Mojo are registered trademarks, and Fused Deposition Modeling is a trademark of Stratasys Ltd. and or its subsidiaries or affiliates. All other trademarks are the property of their respective owners. The statements in this press release relating to Stratasys’ expectations of the benefits that it will receive from its partnership with Amazon.com are forward-looking statements reflecting management's current expectations and beliefs. These forward-looking statements are based on current information that is, by its nature, subject to rapid and even abrupt change. Due to risks and uncertainties associated with Stratasys' business, actual results could differ materially from those projected or implied by these forward-looking statements. These risks and uncertainties include, but are not limited to: the risk that the benefits that Stratasys expects from the partnership will not materialize, or could be less than Stratasys currently expects, due to technical or other unforeseen reasons; and other risk factors more fully explained under the caption “Risk Factors” in Stratasys' most recent Annual Report on Form 20-F, filed with the Securities and Exchange Commission (SEC) on March 3, 2014. Stratasys is under no obligation (and expressly disclaims any obligation) to update or alter its forward-looking statements, whether as a result of new information, future events or otherwise, except as otherwise required by the rules and regulations of the SEC.